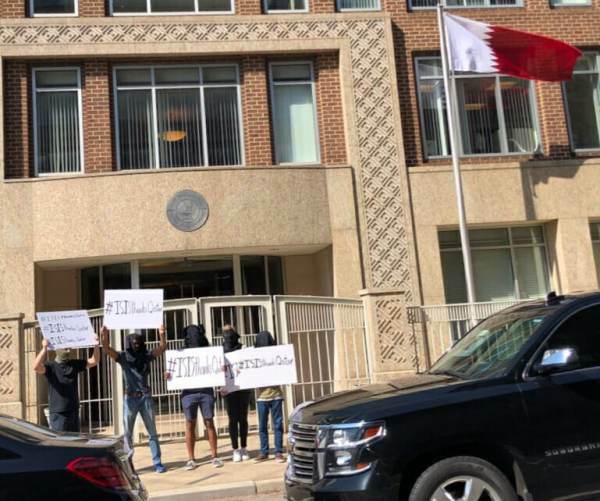 As the emir of Qatar visited Washington, DC, meeting with the president who formerly accused the nation of historically funding terror at a “high level,” activists gathered outside the Embassy of Qatar dressed like ISIS. During Sheikh Tamim bin Hamad Al Thani’s visit with President Donald Trump, the Qatari emir claimed that the nation now has a “zero tolerance” policy on terror. In November, Saudi Arabia, Egypt, the United Arab Emirates and Bahrain cut ties with Qatar and named 59 people and several charities linked to the nation that are on a terrorist list. Qatar was accused of backing al-Qaida and ISIS ideology and helped to prop up the militant groups. They also provided financial assistance to Egypt when the Muslim Brotherhood was in power. The Trump administration has recently told Congress that they plan to approve a deal to sell Qatar $300 million in “Advanced Precision Kill Weapon Systems,” including 5,000 high-explosive warheads and the same number of rocket motors, Fox News reports. The post Activists Dress Up As ISIS, Troll Emir of Qatar With #ISISThanksQatar Hashtag appeared first on The Gateway Pundit.